Before my diagnosis, I was having a hard time just getting through a day. I couldn't bear to walk up a hill to classes (which my deteriorated leg muscles clearly couldn't do), sitting through a class and trying to concentrate, and not being able to do fun things like college students do. When I found out a pituitary tumor, I thought that the nightmare I was living would be over pretty fast. I imagined that a tumor would be a sure sign that I did have this disease I had been campaigning for. For the week between my MRI and my endocrine appointment, I was able to joke about my "brain tumor" with my roommates, I cried my eyes out to my academic advisor, but most of all, I was angry. Angry that it took so long to get this clue, angry that I was actually right about my probable diagnosis, angry at everyone who doubted me or told me to go exercise more. 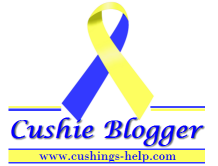 Going back and reading this post that I wrote just weeks after being diagnosed with Cushing's, I realized I still struggle with those feelings of loss. In the post, I wrote that I will be getting back to normal soon. I didn't realize how long this journey could take. More than 2 years later, I have come to the realization that THIS is my new normal. I will never be a "normal" 26 year old, or 40 year old, I will always have to be careful about my medications and worry about anything that could compromise my new version of health.